Wind blowing from the side can put a load on the side of the boom and blow the load off vertical; which, in turn, places an additional side load on the boom. 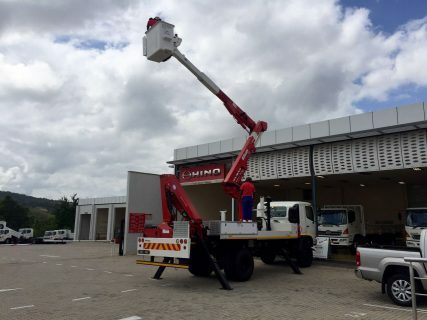 The aerial work platforms market in Africa is ever growing with new customers and applications being created daily. According to Gregory Bloom the Sales Manager at Skyjacks a suppler of AWPs in South Africa, more customers are learning that AWPs are safer, quicker and more precise than traditional working at height methods. However, weather conditions are known to affect aerial work platform lifting activities. Mr. Bloom mentions that weather conditions could definitely have adverse effects on lifting activities therefore operators need to be trained effectively that weather conditions can change very quickly. Additionally, there is need for consideration for the same both during the planning and execution of a Boom lift or Scissor Lift. Shrewdness is a skill required when assessing the level of the wind and the suitability of lifting operations with regards to the same. As Sara Bassetti of the Marketing Department at CTE Spa a manufacturer of AWPs in Italy mentions, different manufacturers have some set specifications in terms of the maximum permissible wind speed/gust as well as how to reduce the crane power under windy conditions to avoid damages. “A buyer should verify the features of the aerial platforms on the user manual, to know the special recommendations concerning the maximum permissible wind speed as the wind can adversely affect aerial work platform lifting activities,” she adds. 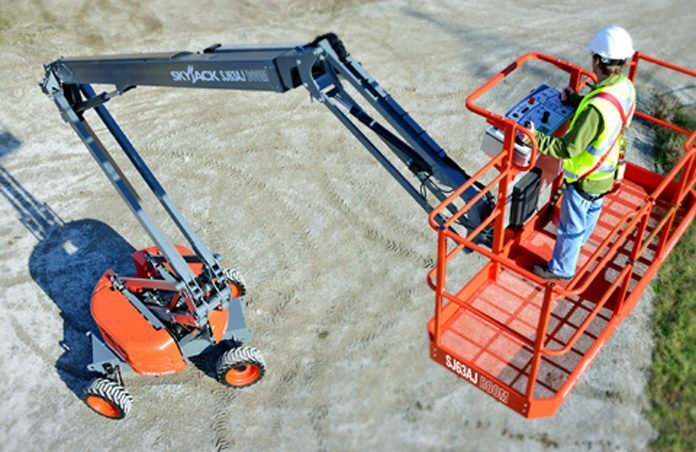 Moreover, according to Jasmin Costillas of Safelift a market leader in the sales and rental of Mobile Elevated Work Platforms (MEWP’s) in the UAE, all access machines have a wind rated operational rating, this can be found on the serial plate of the machine or in the operational manual supplied with the machine, weather conditions are also stated in the manual and if required options can be fitted which are called environment packs, for hot and cold areas outside of the standard operating temperatures of the machine, this would be in the form of different oils and protection of moving parts. However, in cases of lack of information on either the load chart or in the operating manual instructions, the crane manufacturer should be consulted. Additionally, maximum allowable wind speed/gust and derating information is posted conspicuously in the cab or right on the load chart. According to Craig Pieterse of SA Platforms a supplier of AWPs in South Africa, all aerial platforms are designed to withstand a wind speed of 12 meters per second. Obviously some units can handle this with relative ease, while for some units it is about maximum of what they can tolerate. Elimination of immediate threat should be done to ensure there’s enough time to secure all loads and stow the crane, 30-45 minutes, of wind speeds reaching the 20 mph reading. These wind speeds will be recorded at 30 ft. above open ground or by the 10 meter height of the BNL tower. Moreover, Mr. Pieterse adds that when purchasing an AWP, it is all about flexibility in the structure of the booms and the overall feeling of strength and comfort. “If a unit feels ‘flimsy’ without evidence of strong winds, chances are that the aerial platform will handle the legal limit with a small margin only. If the unit feels solid when operating under normal conditions it would withstand stronger winds a lot better than a unit that feels flimsy,” he asserts. Mr. Willem Mostert of Crane & Forestry equipment in South Africa further mentions that, the buyer should look for a solid product, a product with years of testing and operation, one that has proven itself. “One of the main factors regarding wind will be to use a unit with as little play possible between the booms and extensions as well as a unit that has sensitive controls. A small and slow movement should result in a smooth and slow movement of the platform; you would like to have as much control as possible. And off course have an accredited installer to install the aerial platform,” he adds. Crane & Forestry equipment does truck mounted platforms that mainly range between insulated and non-insulated platform. Wind blowing from the rear of the crane increases the radius and decreases the crane capacity, and as a result causes the load to be blown away from the crane. According to Daniele Lanzini of Centro Elevatori SRL a supplier of AWPs in Italy, there are no new technologies that have been designed to overcome the impact of wind; however, it is important to pay close attention when using aerial work platforms in case of strong wind. “It is therefore advisable to have a normal basket, it is not recommended a glass fiber basket or a closed basket because it increases the impact of wind on a larger closed surface,” he says. Furthermore, Mr. Gabrielle Valli of Comet a manufacturer of AWPs in Italy adds that, frankly speaking it is highly recommended not to operate with aerial platforms in case of strong dominant wind. “However, nowadays aerial platforms are very firm and safe and comply with the health and safety regulations imposed by relevant authorities,” he says. The wind tunnel effect, where air blows around obstructions, can cause local areas of increased velocity that may exceed the safe lifting limit. This is notwithstanding the general wind speed, under which conditions an anemometer should be fixed to the boom point; according to Serena Mingardi of Palazzani a manufacturer of AWPs, in Italy, this will help to measure the exact power of the wind and evaluate if there are good working conditions or not. Furthermore, the anemometer can be installed in the cage and connected it to the platform’s control system so that it can stop all movements of the equipment if it gauges a wind speed more than the safe limits; this is according to Anton Du Plessis the Regional Sales Manager at Palfinger Southern Africa a producer of truck-mounted knuckle boom cranes. Mr. Nici Verster of Goscor a supplier of industrial equipment in South Africa recapitulates that, the Arial work Platform market is a big growing market in South Africa and soon Africa. 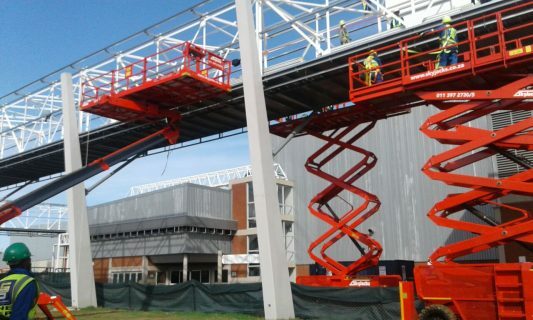 More and more companies are starting to import access platforms into South Africa / Africa. “In Cape Town we have some very aggressive winds over a part of the seasons. That affects the Platforms Working mostly outside of building, ” he adds. “All machine operators should however follow the basic practice of not creating a sail effect on or with the machines, this means, no banners or signage should be hung from the machines. A further technique that can be used is to always try and point either the nose or the tail of the machine into the wind. 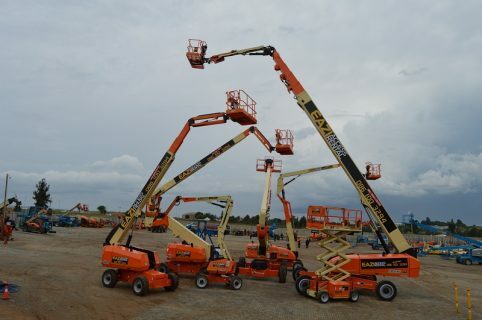 This is part of the guidance to increase safety and all standard work-at-height safety rules and regulations should be adhered to,” says Mr. Chad Pope the Business Development Director at EAZI Africa’s market leader in the rental, sales, servicing and training of work-at-height and material handling solutions. Cold weather can have a negative impact on cranes and aerial work platform operations. Along with making the operator extremely uncomfortable, cold weather can affect many systems in an aerial work platform. Ms. Richelle Fichter of Ahern Companies a dealer in high reach equipment, which permits the safe lifting of people or materials to work at height in the UK, mentions that, cold temperatures cause the thickness of hydraulic fluids to rise significantly, potentially resulting in cavitation in pumps, slow operating speeds, response issues, and poor lubrication for many components. Some of the widely-known problems include freezing of the block and cooling systems, hard starting, dead batteries, and diesel fuel gelling. “Certain steel components cannot withstand extreme cold, which may result in warping of the machinery. In these conditions, impact loads can cause steels to act more as a brittle material instead of the normal ductility that is expected with a steel product in warmer temperatures,” he adds. When temperatures drop below 10F, consultation with the Plant Engineering Division’s Crane/Hoisting and Rigging Inspector and/or Plant Engineering Division’s Rigging Supervisors is highly recommended. Cold weather lifting restrictions start from below -15oC to -30oC, where all operations involving hydraulic cranes are to be conducted with regard to potential failure of hydraulic components. For critical lifts, cranes should be powered down by at least 25%. For temperatures below-30oC to -40oC cranes should be powered down by 40% for all lifts, and halting of all lifting activities should be considered. Lastly, for temperatures below-40oC all lifting is prohibited except for extreme emergencies. “The growth of the aerial platform (MEWP) market into Africa has been steady due to the efficiency gains that users experience through access equipment, however the current macro-economic market does have its elements of concern, especially for capital intensive industries such as our own,” says Mr. Pope of EAZI.